If you are expecting family or friends over Easter, this is the perfect cake. Not only does it contain unusual ingredients, but the way of making it is also unusual. It also keeps well in a tin or wrapped in foil for up to a week. The hazelnut marzipan is simple to make but you can substitute a 500g pack of bought marzipan. Preheat the oven to 150°C, gas mark 2. Butter a deep 20cm round cake tin and line the base and sides with non-stick baking parchment. In a large pan gently heat the butter, sugar, dried fruit, orange rind and juice, stirring occasionally, until the butter has melted and the sugar has dissolved. Simmer for 5 minutes, stirring, then remove from heat and cool for 15 minutes. Sift the flour and mixed spice into the cooled mixture, then stir in the eggs and hazelnuts. To make the marzipan, put the hazelnuts in a food processor and blend until fairly smooth. Add the caster and icing sugars and blend again until evenly mixed. Add the egg and blend to a smooth paste. Reserve half and wrap in clingfilm. Press the remaining half out into a 20cm round on a piece of clingfilm. Spoon half the cake mixture into the prepared tin and smooth with the back of a large spoon. Invert the round of marzipan on top and peel off the clingfilm. Spoon the remaining cake mixture over and smooth the top. Bake for 1½-1¾ hours until rich golden brown and firm to the touch. If it starts to brown too much, cover with a piece of foil. Cool in the tin for 10 minutes, then turn out, peel off the paper and cool completely on a wire rack. Brush the top of the cake with honey. Roll remaining marzipan to a 20cm round and place on the top of the cake. Pinch the edges all round to make a frill. Slide the cake under a preheated grill for about 1 minute until the marzipan is tinged brown. Put on a serving plate to cool. Sift the icing sugar into a small bowl. Add the water and blend to a smooth paste. 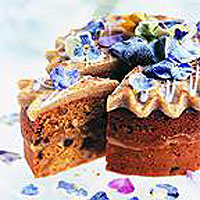 Drizzle the icing over the top of the cake and decorate with frosted pansies, or foil-covered mini chocolate eggs. Leave to set. Note: Because this dish contains uncooked egg, it is not suitable for the young, pregnant women, elderly people or those whose immune systems are weak.